Turmeric is an Ayurvedic spice that’s been part of Indian and Eastern culture for thousands of years. Turmeric’s rich, golden colour comes from a natural compound called curcumin. To make curcumin easier to digest, we’ve added a tiny pinch of black pepper extract to each turmeric capsule. While turmeric is deliciously flavoursome when added to chai or curry, the powdered spice is a little too bitter to eat on its own. 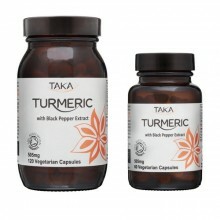 These handy capsules make it much easier to top-up with a daily dose of turmeric. Click the button below to add the Taka Turmeric with Black Pepper Extract Capsules 60 Vegicaps to your wish list.